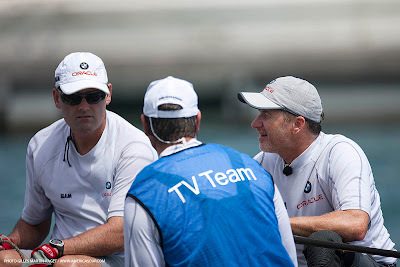 Austrian multihull aces Roman Hagara and Hans-Peter Steinacher, the Red Bull Extreme Sailing Team, are among two sailors who helped the BMW ORACLE Racing crew leap-frog their level of multihull knowledge in preparation for the 33rd America’s Cup. “It was our job to make the BMW ORACLE Racing crew better multihull sailors, because they were all from the monohull scene and didn’t have much multihull experience,” says Hagara in the current issue of Red Bulletin, Red Bull’s monthly sporting and lifestyle magazine. BMW ORACLE Racing skipper James Spithill joined Hagara and Steinacher in mid-August for a sail on Lake Zell in central Austria. Red Bull invited Spithill to take part in a helicopter aerobatics flight with Hagara and Steinacher. Spithill, a novice pilot, was jacked after the ride in the copter: “We went up in their stunt helicopter. There are only four in the world that can go upside down. We did a heap of aerobatics, loops, barrel rolls, hammerheads, and some other things I can’t remember the names. By the end of it I was in a full sweat and just managed to keep the breakfast in. I’m now one of only a few people in the world to do a forward roll in a helicopter — we actually did it four or five times. It was awesome!" Read about Spithill’s adventures in the current issue of the Red Bulletin here (article begins on p.76), or watch an interview with the skipper here.